The Villas at Ashlake is generating lots of buzz! One of our newest 55+ boutique communities, The Villas at Ashlake in Chesterfield, celebrated its groundbreaking on June 14th. The exciting event was attended by a variety of county officials, homeowners, potential buyers, and Cornerstone team members. Located at the corner of Ashlake and Ashbrook Parkways, the Villas at Ashlake is an exciting addition to our collection of 55+ communities. It will have just 82 single-story homes, 12 of which have already been sold. 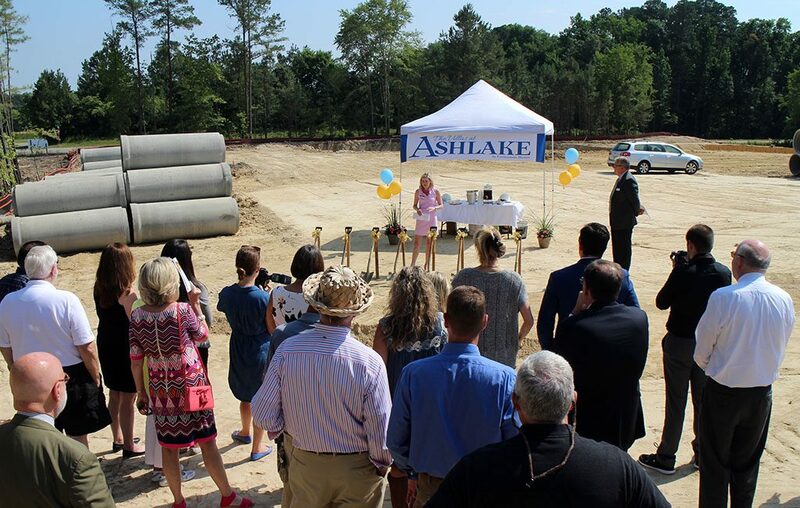 The Ashlake Clubhouse will feature a pool, a fitness center, and an outdoor grill, walking trails, and community vegetable & flower gardens. Whether relaxing by the pool, playing in the gardens, or sitting by the fire, getting to know your new neighbors will be your new favorite pastime. The open and spacious villas feature two and three bedroom designs, ranging from 1,500 to 1,900 plus square feet with an attached two-car garage, patio, sunroom, or private courtyard. The homes are tastefully clustered together with the community clubhouse to make a small, close-knit neighborhood. The unique maintenance-free homes feature attractive stone and siding exteriors with interesting architectural details. Inside, there are cathedral and tray ceilings, elegant finishes, and unbelievable features. The gourmet kitchens feature large islands, state of the art appliances, and beautiful cabinetry. There are private outdoor living spaces, guest suites for visitors, and luxurious master bedrooms. The prices for the homes start in the $270’s. For more information about The Villas at Ashlake, please contact Carrie Jamieson Morak at 804-234-8525 or visit Ashlake55.com.